Paul George is out with a right shoulder injury. 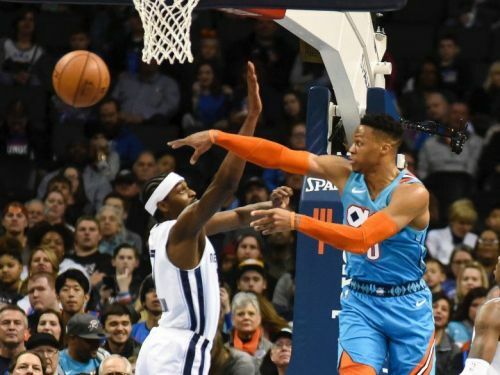 Oklahoma City had to put in extra effort to pull off a win against the Grizzlies, mainly because their MVP candidate missed his third-straight game with a sore shoulder. Brodie and his squad willed their way to a come-from-behind 99-95 win against the visitors as the league leader in steals and the second-best scorer sat out yet again. This was OKC's fifth win in the last ten games as they improved to 39-24 (0.619) on the season. Tied for the third spot with the Trailblazers after the win, Oklahoma are still 5 games behind the West leaders in the Warriors. With the Grizzlies being the second worst team of the Western Conference (after Phoenix Suns) this was an uncharacteristically tough win for the hosts. The loss means that the Gasol-less Memphis side drops to a dismal 25-40 (0.385) win-loss record on the season, grazing the bottom of the West leaderboard at the 14th spot. On that note, let's take a look at some talking points from this Grizzlies-Thunder clash. Steven Adams is averaging a career-high in rebounds this season so far. 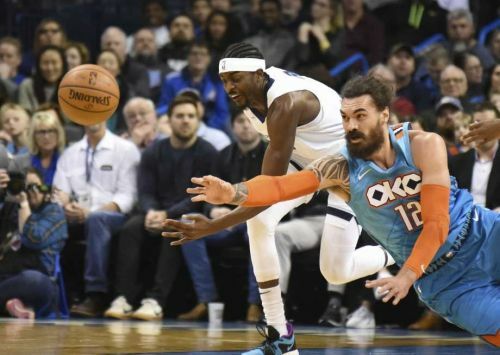 Steven Adams and Jerami Grant combined for 26 points on a night when their team needed all the help possible. Adams finished with a double-double of 13 rebounds and 22 rebounds (one short of his career-high), which included 8 offensive boards as well. Dennis Schroder put together a double-double of his own, aiding the Thunder's winning cause through his 17 points and 12 rebounds. He also chipped in six dimes and a couple of steals to make up for PG13's absence on the defensive perimeter. "With Paul out, certainly offensively, it's been a challenge the last several games," Donovan said. "I've been trying to find a way to keep helping our guys offensively in order to create an identity with him being out." Abdel Nader gave Coach Donovan some valuable minutes, contributing 15 points on 3-6 shooting from deep. Expectedly so, Westbrook came up with a team-high total of 22 points and some crunch play during the final minutes to seal the deal for his team.